KL turbine (not shown) is the uni-directional turbine, one end black, the other ivory. No. X17090 adapter between 17090 mask and KL turbine has a luer lock type sampling port. No. X17091 adapter between 17090 mask and KL turbine has no sampling port. MIR is the bi-directional turbine, all black, as shown in photo. To adapt your existing Rudolph face mask to the "MIR" turbine order adapter # R200542. Mask face piece material is silicone. 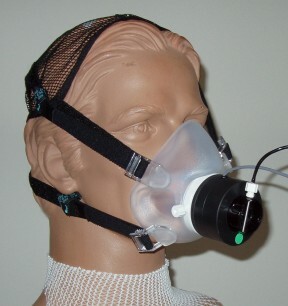 See also Replacement Parts and Adapters for Rudolph Masks to purchase face piece and head gear separately.